Photo Friday: Grant Training Enrollment Open! Enrollment for Prosperity's 2-Day Grant Training Course is now open!! There are two date options in October to Register. See below for more details. Space is limited to first 20 registrants! - Understand why and when to use grant funds. - Effectively and efficiently search for grants. - Determine eligibility and grant feasibility for project success. - Complete any basic grant by learning major application components. Click here to register for the October 23rd & 24th course! Click here to register for the October 29th & 30th course! This Wednesday Sarah Aubrey, Prosperity Principal, is attending her second of two continuing education classes this fall for her Grant Administration Certification. With Sarah's wealth of grant writing knowledge, she will be launching two options for her 2-day Grant Feasibility and Application Basics Course in Indianapolis next month! Enrollment opens this Friday for October 23 & 24 and October 29 & 30 dates. Looking forward to lunching with Indiana ladies in agriculture today! Thanks Elanco for being our host! Here's a shot pulled from the archives of ALP women getting ready to tour a farm in Hungary! Lookin' good here! Prosperity Ag and Energy Resources released our first white paper today titled Public Relations Mistakes Biomass Developers Make. Industry experts Jay Catasein of Twisted Oak Corporation and Mike Dunn of Indiana Soybean Alliance discuss solutions to keep biomass projects moving forward. 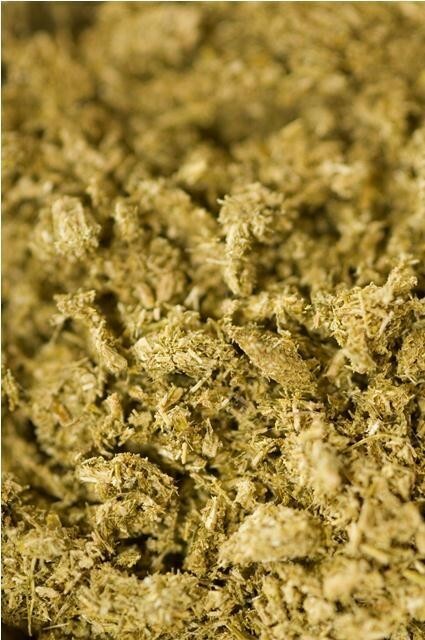 Moderated by Prosperity's owner Sarah Aubrey, this white paper offers ideas for community acceptance of new biomass projects outlined in savvy public relations tips. Follow the link below for the full document. This Photo Friday we are thinking of our fall activities and projects, and we look forward to scheduling our upcoming grant training and educational courses. We are booking groups October 1st and thereafter! Sarah Aubrey, Certified Grant Administrator and Member of the National Speaker Association, will be delivering customized grant training solutions for companies, trade groups, and individuals. We can deliver a two-day course or a 5-part webinar to your group or to you as an individual.If you are a busy project developer or a business owner who would like to understand grants, learn how to find them, and develop winning proposals - call us today! Photo Friday: Here's to Your Prosperity! This "Photo Friday" represents growth and prosperity. Have a great weekend, and here's to YOUR prosperity! 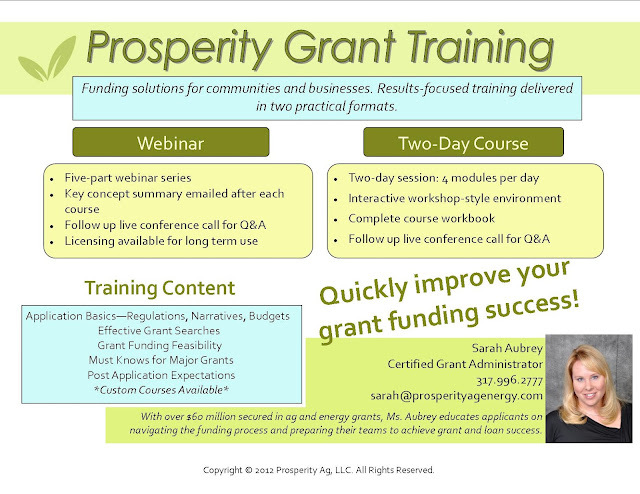 Prosperity is excited to announce the launch of our first grant training course! Please see attached flyer detailing this new educational service. Prosperity recognizes the need for communities and businesses to improve their own grant success, better prepare themselves to work with consultants, and better prepare their team with grant writing and reporting. Our results-focused training will quickly improve your funding success and can be delivered as a two-day course or as a five part webinar series. We are accepting and booking groups for October 1, 2012 and thereafter. If you are a busy project developer or community leader who would like to better understand the process and expectations of achieving funds, this course is perfect for you! Useful topics include application basics, how to search for programs, major grant ‘must knows’, and post application expectations. Custom courses are also available. Contact us today to discuss booking, group fees, and how the available courses can benefit your organization.